All offers must be submitted by the Buyer&apos;s agent via the RES.NET Agent Portal. Spacious Ranch home on 6+acres in Fayette County! 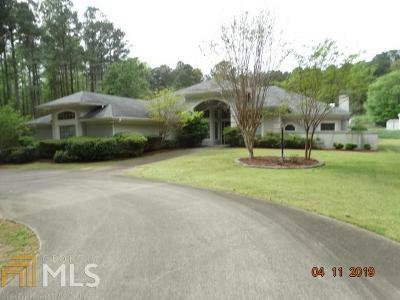 Foyer entry, LR, DR, Family Rm w/FPL, Kitchen w/Breakfast area, Island, Master Bedroom w/WIC, FPL, Private Bath, Spacious Secondary Bedrooms, Steam Rm, Laundry Rm, 3 Car Garage and a Heated Covered In-ground pool! Work Shop and Out Bldgs. Directions: Take Old National Hwy South. Turn Right On Old Ford Rd. Turn Left On Melanie Ln. Turn Left On Melanie Cir. Home On Left In Cul De Sac.